RETRO KIMMER'S BLOG: ROCK SAX LEGEND PHIL KENZIE FROM THE BEATLES AND EAGLES TOUR /NEW RELEASE! 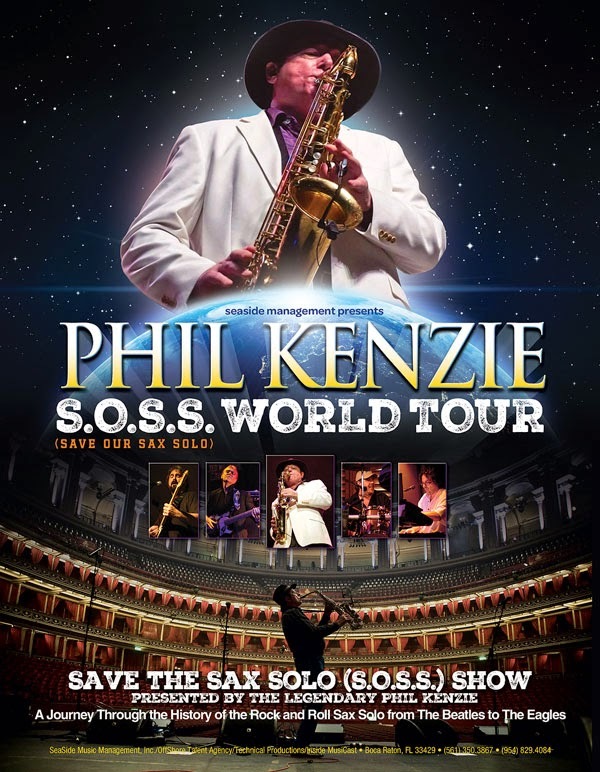 ROCK SAX LEGEND PHIL KENZIE FROM THE BEATLES AND EAGLES TOUR /NEW RELEASE! Nashville, TN - With the recent passing of Bobby Keys, the last of the legendary rock sax players still remains - Phil Kenzie! Phil has the great distinction of playing sax on The Beatles legendary 'Let It Be' album! Along with The Beatles, Phil's impressive resume includes recording sessions and tours with such iconic music groups and artists as John Lennon, George Harrison, Paul McCartney, Black Sabbath, David Bowie, Rod Stewart, The Eagles and many others. It's easy to be familiar with Phil Kenzie's superb sax work. Just recall the soaring solos on Al Stewart's “Year of the Cat” or “Time Passages” still enjoying favored airplay to this day, or the punchy brass intro to “Jet” by Paul McCartney, or the inspired solo on “The Long Run” from “The Eagles Live” album. In fact, this gifted sax player/arranger has lent his masterful touch to hits by everyone from Rod Stewart to Jackson Browne, Stevie Nicks and Rosanne Cash to David Bowie, and in the process amassed some nineteen gold and platinum albums! Phil also holds the world record for the highest note ever played on Alto Sax on a solo on a top ten hit record (entry note on the first solo on “Time Passages” by Al Stewart). A documentary of Phil's incredible musical journey is in progress and is 99% finished. With 120 minutes in length, it is produced by Harry Jarvis an Independent video producer from Nashville TN. Phil relates, “I'm originally from the Liverpool area in England and in my first band, The Pressmen, I played many of the clubs made legendary by The Beatles, even occasionally sharing billing with the 'Fab Four', including The Cavern and Hamburg's famous Star Club. So it was totally appropriate that I should be asked later to play on the most classic 'swan song' of the century, 'Let It Be'. This connection continued with my work on recordings for Apple Records, most notably John and Yoko's 'Plastic Ono Band' at Lennon's home in Ascot and all of the horn section work and solos on George Harrison’s 'All Things Must Pass' and playing in the massive sax section on 'Jet' for Paul McCartney and Wings. Through these sessions, I also worked with such notable stars as Eric Clapton, Steven Stills, Peter Frampton, Delaney & Bonnie, Leon Russell, Doris Troy and Billy Preston. “As a session man, I was doing gigs around London with Manfred Mann's 'Chapter Three', arranging and performing shows for Jack Good's psychedelic update of Othello entitled 'Catch My Soul', finding time to appear on Paul McCartney's 'Band On The Run' album and to be heavily involved in the hit cult classic 'The Rocky Horror Picture Show', playing and recording both the show and the movie; supplying the screaming rock sax for Meatloaf's portrayal of 'Eddie'. During this time I also worked with Alan Parsons, David Essex, Joan Armatrading, Ian Gillan, Alex Harvey, Leo Sayer, Black Sabbath, Steve Harley, Marc Bolan, Wishbone Ash, Annie Lennox, David Bowie, The Coasters, The Temptations, Arthur Connolly, Mick Ronson, Ian Hunter and Roger Daltrey appearing on his 'Ride a Rock Horse' and 'One Of The Boys' albums and on both David Bowie's 'Diamond Dogs' album and his wildly inventive television special 'The 1980 Floor Show'. Says Phil, “The album's listed producers are Phil Kenzie and Michael Snow and the album was recorded partially in Los Angeles and partially in Nashville Tennessee. It was done in my personal recording studios using analog and digital methodology and myself being the recording, mixing and mastering engineer. I am Industry recognized in these fields.